Thousands of people have flocked to a small Romanian church after two men said they had seen the Virgin Mary 'crying' in a painting. "It is a sign from God, but I cannot say if it's a good or bad sign." 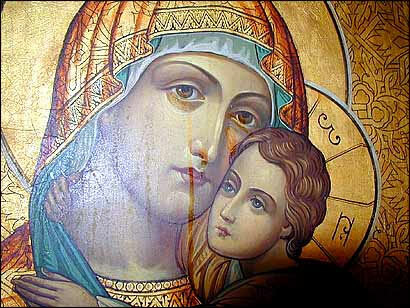 The delegation is continuing investigations into the claims and taking statements from other people who say they saw the Virgin Mary crying. The claims come just weeks after reports of tears coming from a statue of the Virgin Mary in a church in Giurgiu, southern Romania.